Third class have been really busy in June working on an animal project. Most children chose an endangered animal to work on. We spent sessions in the computer room researching our animals answering questions about habitat, diet, classification and predators. They had a lot of fun doing their work and presenting their work. 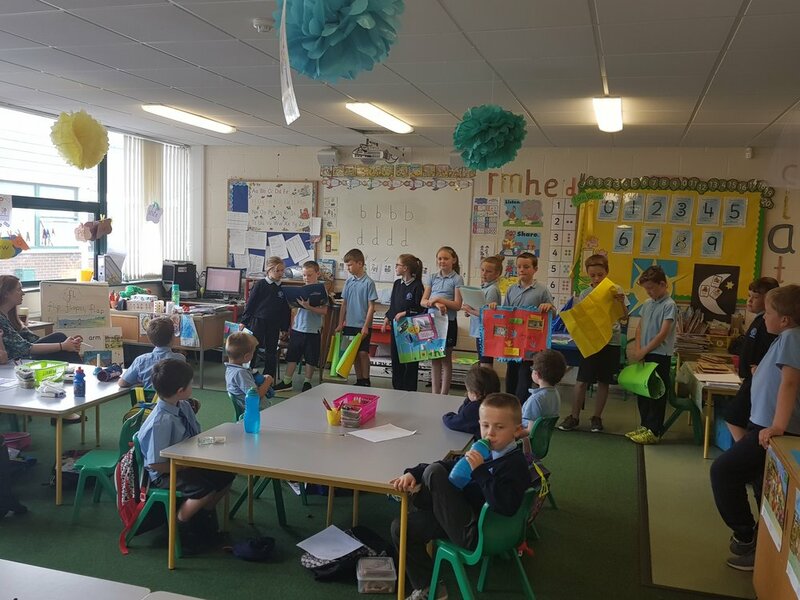 They even got to present their work to Senior Infants! 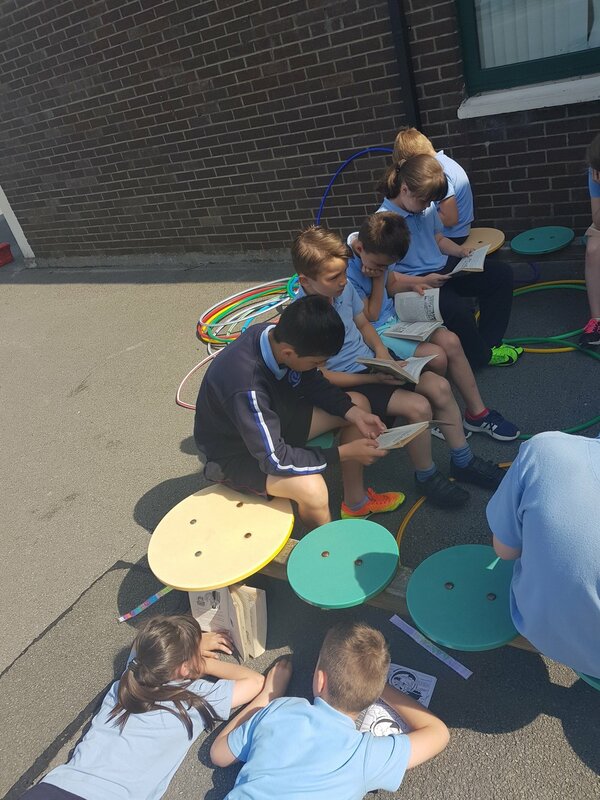 Third class enjoyed a a break outside their books from our class library. Well enjoy the sunshine while it lasts! Over the last few weeks Third Class have been learning about Homes. We discussed the various types of houses such as detached, semi-detached, terrace, apartments, bungalows and duplexes. We talked about the various rooms in the home and things we might find in these rooms. We identified our favourite rooms in our house and this inspired our "Through the Keyhole" images. Talking about Homes lead to discussions about Homelessness, an issue in which the children had some knowledge on. The children were very aware of the fact that some people sleep on the streets, in shop doors, near the beach etc. We also talked about the fact the homelessness comes in lots of forms. It can be couch surfing, sleeping in your car, maybe living in a hotel. It is not having a space to call your own. It made us realise that we are lucky enough to have a home! We also created homes as a group project. The children worked in group to design the rooms in their home. The only criteria, they had was that there needed to be a kitchen, bathroom, bedroom and living room in each home. So amongst each group they decided who was making what. Some children worked individually and others worked in pairs. They had a great time making their homes and are very proud of them. 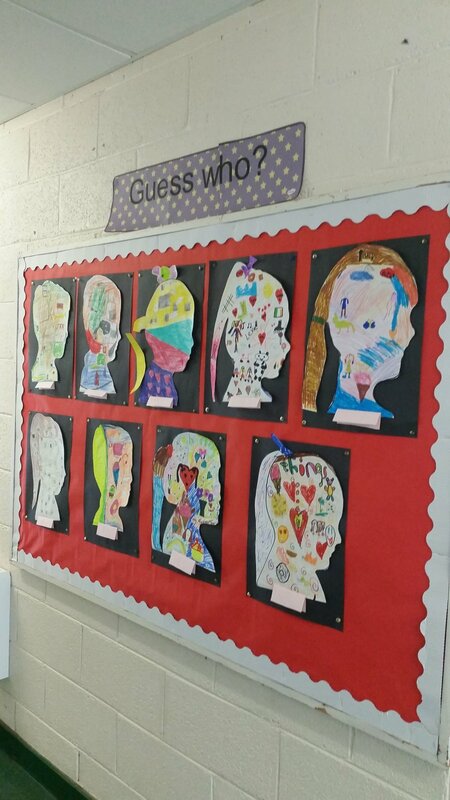 Third Class have spent a lot of time over the last couple of weeks learning about themselves and their families. They have been looking at their strengths, weaknesses, uniqueness. They've identified their likes and dislikes. From this sprang their art, where the children drew all their favourite things inside their silhouettes. Then we guessed who? We also spent a lot of time talking about our families. We talked about the people who live with us and also people who are family that might not live with us. We discussed that the children can have different family structures but the important thing that ties a family together is love. We also talked about lots of ways to show love to our families and how they show love to us. Here are some pictures of the family trees. We also spent a lot of time researching family names. Irish surnames have all have a coat of arms to describe the family traditions. We looked at all the surnames that we could find. As not all the children had a coat of arms, we decided to create our own. We used the information we learned; different meanings for each colour, different animals have different meanings and certain shapes in the crest mean different things. It was a very interesting project listening to the chlldren talk about the things that represented their families.